Whether its furnace repair, maintenance, or installing a completely new system, you can count on Napco Heating & Cooling. Our technicians have the training and experience required to ensure your family stays comfortable all year round. For immediate service please call. What do Good Furnaces Have in Common? The best furnaces are efficient. They keep a home warm and comfortable. They provide steady, dependable performance year after year. And they are quiet, long-lasting and low in service frequency and cost. 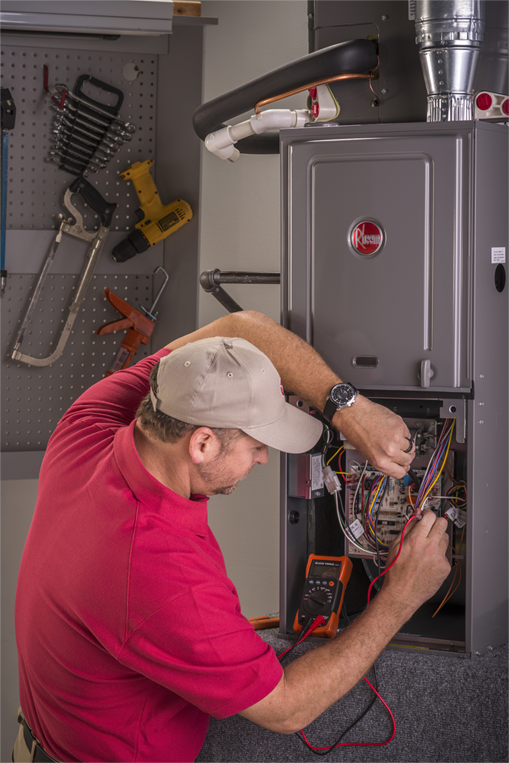 Call us today to find out more about our furnace repair service. Which Furnaces are Energy Efficient? When a furnace loses or wastes heat, it requires more energy to keep your home warm. Some furnaces lose heat through the walls of the furnace cabinet. Energy-efficient furnaces like Rheem‘s full line of state-of-the-art models significantly reduce this loss with a blanket of insulation that lines the inside of the cabinet walls. When a gas furnace is not in operation, most send a steady, wasteful draft of warm household air traveling up the venting system and out the roof. The Rheem products feature an induced-draft blower that works in conjunction with a hot surface ignition system to pull hot gases through the heat exchanger at a constant and controlled rate of flow. As the burner cycles off, the draft blower stops, keeping the heating air in the system. Pilot lights also can be wasteful. The electric ignition in many of Rheem’s furnaces eliminates the need for a constantly burning pilot. This feature alone gives up to 6% higher efficiency. And in combination with an induced-draft blower, can improve furnace efficiencies by over 20%. Most gas furnaces vent combustion by-products and gases by allowing the warm air to rise naturally. However, on occasion, proper venting of combustion by-products may be restricted due to blockage, deterioration of venting systems, malfunctions or other causes. 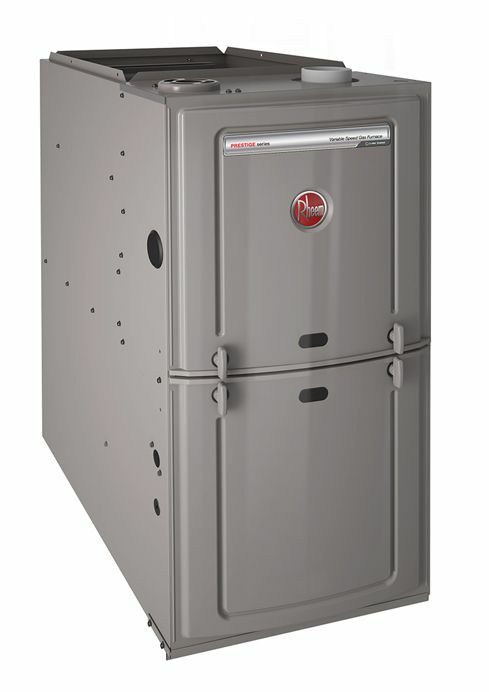 The Rheem induced-draft blower maintains a constant draft through the heat exchanger, which assures proper venting of the furnace combustion chamber. Rheem also features a pressure switch which continuously monitors venting; and in the event it senses a vent flow restriction, it will automatically shut down your heating system for your safety. The most efficient furnaces tap the energy of the hot vent gases – which can reach temperatures of 500 degrees Fahrenheit, and more. A high-efficiency furnace generally wears a higher price tag, but it can make up the difference by reducing operating costs over the long run. And with today’s consumer interest in efficiency, such equipment enhances the bottom line of your home. Are some furnaces better than others? Definitely. Features to look for include heat exchangers that resist corrosion, direct-drive blower units, induced draft blowers, pressure switches, and an insulated blower compartment, which helps minimize operating noise. The best brands but a convincing warranty behind their work. 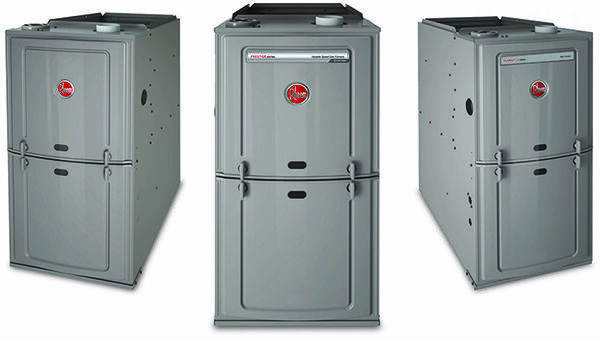 Rheem furnaces offer one of the very best Limited Lifetime Heat Exchanger Warranties. One in four furnaces in U.S homes today are more than 20 years old? Older furnaces were not built with the same energy-saving technology as today’s products. Your older furnace could be costing you hundreds of dollars a year between maintenance needs and energy usage. 956 Little East Neck Rd.